For this review I am revisiting a trade that I read awhile back and I got the hankering to read it again. DC did an animated movie called Doom that was based on it. Given it was a pretty loose basis. 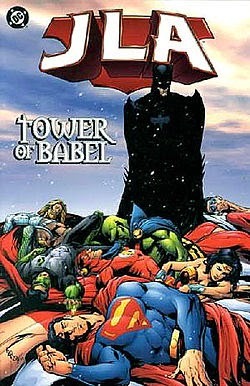 In the story “Tower of Babel” Ra’s Al Ghul has decided that mankind is doing too much damage to the world and wants to return it to it’s rightful rulers, the ever decreasing animal population. But he knows that his plan will never succeed as long as the Justice League can get in the way. So Ra’s Al Ghul puts into effect a plans that will get them all out of the way. Plans that were created by one of the Justice League members, Batman. Batman compiled these plans as contingencies against the event that the Justice Leaguers are ever turned by any means. But they were never meant to be used by anyone other than Batman himself. So he removes Batman from the equation by stealing the bodies of his parents. This will keep Batman too busy chasing the bodies around the world to interfere before all of the other members are taken care of. So with Batman out of the way Ra’s starts taking down the JLA one by one in creative ways based on their weaknesses. For example Martian Manhunter who is afraid of fire gets covered in nanites that make his skin produce magnesium, which will burst into flame when it comes into contact with oxygen so he will become a living torch. But as fast as the JLA responds to the threat against them it isn’t fast enough so before long all of the members have been neutralized. With no one left to stop him Ra’s puts his true plan into motion. A plan to use a specific frequency to make it so everyone in the world is dyslexic. This will cause worldwide chaos as no one can read simple signs that can stop all out war out of already volatile situations. And once the war begins it won’t be long until mankind wipes itself off the map. This has to be one of the best, if not the best Justice League story I have ever read. It really highlights all of the members of the JLA and lets them shine. As well as showing just how deep seeded Bruce’s paranoia is. And shows what he will do to protect the world, even if it’s from the people he calls his friends. There is even a great piece in this arc that shows the ideological differences between Talia and her father. This arc gets even better with each time I read it. And it will go down as one of the only JLA books I have truly enjoyed. That may have to do with the fact that it was written by Mark Waid who I have yet to read a comic by that i didn’t like.